Did you know this week is National Nurses Week? I didn’t even know there was such a thing…until nurses became our real-life superheroes. Jax spent a month in St Cloud. It was the scariest time of our lives – Jax was very sick and we were a long way from home. The doctors and nurses made us feel like family. They did everything they could to help make it easier for us to understand what was happening. Dr Ajayi, the neonatologist who was there for Jax’s delivery, ended every report with a “prayer point.” These short term goals where what helped us put one foot in front of the other – and gave us something to hold on to when other things weren’t looking so good. Well, no problems there! They all remembered the “23 weeker that was born on vacation!” Even some parents came up to us and said they had heard about his story. There were hundreds of other families there with healthy kids running all around. I could see it in every parent’s eyes, the sense of gratitude and kinship that comes with knowing how it feels to breathe a sigh of relief when your child is discharged from the hospital and you think to yourself, “whew that was a close call.” There’s also the underlying sadness for all the babies that didn’t make it. We knew how much they affected our lives, but we had no idea how much Jax affected theirs. We were so thankful to be able to hug them and tell them how much they mean to us! Nurse Jenny and Nurse Deb were there during Jax’s delivery. They made Steve feel more comfortable by explaining what was happening while they were rushing down the hallway to the NICU. Nurse Deidra, at my request, practiced healing touch on Jax every night on the overnight shift. (If we had had more time in St Cloud, I have a feeling Deidra and I would have become friends.) Nurse Deb (we had two!) had the most peaceful presence about her and she always made me feel like I was making the right decision. The St Cloud Hospital is also one of the first NICUs in Minnesota to offer a March of Dimes Family Support Program. 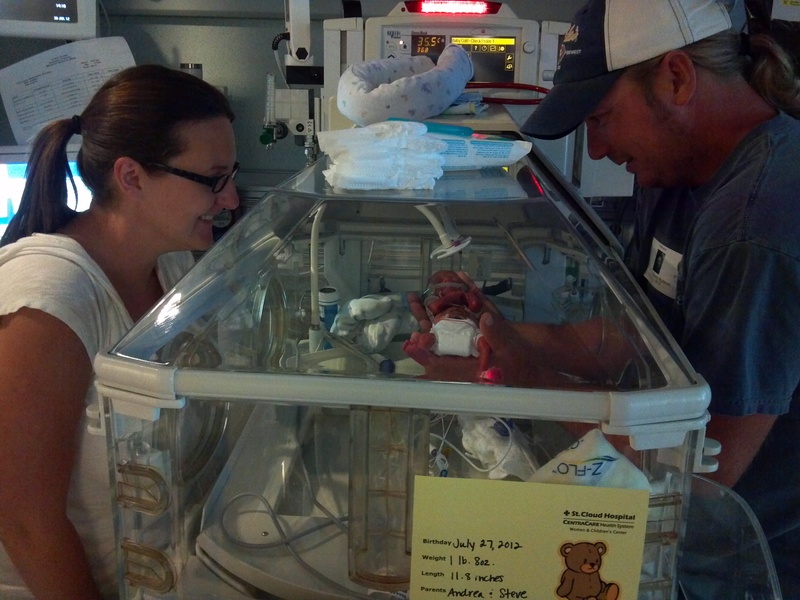 Jen, our support specialist, did everything she could to make the NICU experience better for families. A couple of times a week, we celebrated a crazy holiday like “National Ice Cream Day” with sundaes in the family room and “National Relaxation Day” with a head scratcher. I still have all the funny gifts she gave us – they helped lighten the mood. She took photos of our tiny baby and sent us a CD after we were transferred. She shared her own experiences with the NICU. I felt lucky to have her support! So, in honor of our nurses and the staff in St Cloud, we say thank you! Thank you for everything you did to save Jax’s life. Thank you for everything you did to make him comfortable. Thank you for everything you did to make us more comfortable. Thank you…there are not enough words…thank you! I wish our NICU’s had reunions!!! That is so awesome! I do remember nurses week last year, we were at the U still. I think the Baby Steps 3K Walk is the “Children’s NICU Reunion!” They have a party afterward where the nurses and doctors will be there. 🙂 Too bad it’s your cabin weekend! But, next year! How wonderful to get to reconnect in a good way where it all started. Jax has come so far. For the nurses and doctors that helped him in the beginning to see how their hard work has paid off has to make their job feel more rewarding, especially for a “little” guy like Jax. Its so hard when “thank you” doesn’t seem like enough. Even putting fancy words like amazing or awesome job in front of it still doesn’t seem enough. But you are grateful, everyday for everything that has been done for Jaxson. I think not only the gratitude given to the staff that has helped but the truthfulness to every post you write, every picture you take, and the unconditional love you have for Jax is definately saying THANK YOU!! Man, Libby – I don’t know how you do it – You always say exactly the right thing! 🙂 Thank you for your support and your kindness. I planted the irises yesterday and they are already looking happy. Can’t wait to see them bloom. Since it does take a village, you were blessed to have landed in the best village possible. “Like heaven has angels, earth has nurses” said my wise husband last night.